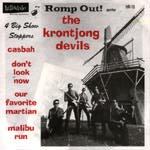 The Krontjong Devils - Romp Out! The Krontjong Devils are probably a great band, and would be killer in a good studio. The sound on this release is really poor, partly due to cheap (pronounced bad) recording, and partly noisy vinyl. Their three guitar line up (dry rhythm, damped staccato heavily reverbed rhythm, and reverbed lead should sound huge, but the smallness of the recording hides it on all but Malibu Run. This single includes one vocal, "Don't Look Now." The Krontjong Devils literally wallop you upside the head with their rousing rendition of Richard Podolor's "Casbah." It's a bit faster than the original without the finesse. The bass line is wrong. Otherwise, a reasonably good version of Bobby Fuller's song. Aggressive version of Randy Holden's 2nd single B-side. The three guitar lineup really shines on this track.